China has announced new details surrounding the lives of itsseven newest astronauts, a group that includes the country's first two femalespaceflyers, according to state media reports. All seven of the newChinese astronauts are pilots in China's People's Liberation Army. They areall married and between the ages of 30 and 35, the state-run Xinhua News Agencyreported. The details were announced last week during a meeting of the GeneralArmament Department at Beijing Aerospace City, Xinhua said. According to the report, which did not include the names ofthe new astronauts, China's new spaceflyers all have bachelor degrees fromcollege and have each logged an average of 1,270.7 flight-hours, a spokespersonfor the General Armament Department said. The new astronaut recruits are split between fighter pilots(the men) and military transport pilots (the women). Earlier this year, Chinesespace officials said that one requirement for China's firstfemale astronauts was that they were married, a requirement that is alsoupheld for China's male astronaut candidates. The new astronauts possess skills in clinical and spacemedicine, and have "good psychological qualities," Xinhua reportedthe spokesperson as saying. Many of them volunteered for quake relief workduring the 7.9-magnitude earthquake that struck the eastern Sichuan region ofChina on May 12, 2008, the spokesperson added. Spaceflight training for the seven new astronaut recruits isexpected to begin soon. The new astronauts are the latest to join China's ranks ofspaceflyers, which are also known as taikonauts. To date, China has 21 activeastronauts. The China National Space Administration began recruitingastronauts in the mid-1990s. The first class included 14 fighter pilots. China is the third nation after Russia and the United Statesto build and launch spacecraft capable of flyinghumans in space. China's crewed spacecraft is the capsule-based Shenzhou(Chinese for "Divine Vessel). The vehicle is a three-module spacecraftderived from Russia's Soyuz workhorse craft, but carries severalChinese-developed enhancements. Those modifications include the addition of a second set ofsolar arrays on the Shenzhou vehicle's orbital module which allow the segmentto remain in orbit long after its crew returns to Earth in a descent module. China's first manned spaceflight, Shenzhou 5, launched asingle astronaut into orbit in 2003. A two-man mission followed in 2005. 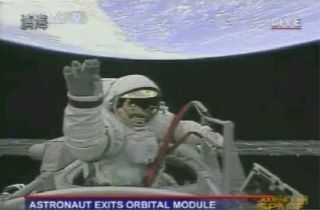 In September 2008, three Chinese astronauts launched on theShenzhou 7 mission that included China'sfirst spacewalk - a 20-minute excursion byastronaut Zhai Zhigang that was televised live on the country's nationaltelevision. China plans to launch Tiangong 1, the first module of aplanned Chinesespace station, in 2011.